The Bar Council Information Technology and Cyber Laws Committee is organising a seminar focusing on the important aspects of information technology (“IT”) and cyber law on 24 August 2017. In this seminar, I will speak on the topic of “Practical Steps in Tracing a Person Online“. I will speak on keyword search investigation, and discovery orders and cases relating to discovery orders against data processors. The other topics would be “Search and Seizures of Computers — Advising Clients” by Ravin Vello, “Wrap n Snap: Technology IP Mash-up” by Suaran Singh and “Overview of Malaysian Cyber Laws and Latest Updates” by Deepak Pillai. Bread & Kaya: Are WhatsApp admins going to jail? I REFER to the recent news reports stating that the Honourable Deputy Communications and Multimedia Minister Jailani Johari announced that group chat admins can be held accountable under the Communications and Multimedia Act 1998 (CMA) if they fail to stop the spread of false news to its members. With due respect to the Honourable Deputy Ministry, the CMA, in particular s. 233 of the CMA, does not attach any liability to an admin of a group chat admin for spreading “false news”. The offence under s. 233(1) of the CMA is committed by a person who uses any network facilities or network service or applications service knowingly makes, creates or solicits and initiates the transmission of an offensive communication with intent to annoy, abuse, threaten or harass another person. Two key elements in s. 233 are not fulfilled by a group chat admin namely “knowingly make or initiates the offensive communication” and “with intent to annoy, abuse, threaten or harass another person”. As for s. 233(2), liability is only attached to a person who knowingly provide or permits an applications service to provide any obscene communication for commercial purposes. This is also not applicable to the present case. It is noted that s. 114A of the Evidence Act 1950 provides for three circumstances where an Internet user is deemed to be a publisher of a content unless proven otherwise by him or her. The relevant section, namely s. 114A(1), states that “A person whose name, photograph or pseudonym appears on any publication depicting himself as the owner, host , administrator, editor or sub-editor, or who in any manner facilitates to publish or re-publish the publication is presumed to have published or re-published the contents of the publication unless the contrary is proved”. In simple words, if your name, photograph or pseudonym appears on any publication depicting yourself as the aforesaid persons, you are deemed to have published the content. To use s. 114A to attach liability on a group chat admin is stretching s. 114A too far. It must be highlighted that s. 114A was introduced to “provide for the presumption of fact in publication in order to facilitate the identification and proving of the identity of an anonymous person involved in publication through the internet” (Explanatory Statement of Evidence (Amendment) (No. 2) Bill 2012). Common sense would dictate that a group chat admin is not a publisher of their member’s messages. Perhaps the Honourable Deputy Minister should clarify which section in the CMA attaches liability to a group chat admin to avoid further confusion and panic to group chat admins. First published on Digital News Asia on 2 May 2017.
iii. Places that have no data protection law but have a code of practice or national co-regulatory mechanisms. The deadline for sending feedback is on the 4th of May 2017 (Thursday). For more details, please click here. I am pleased to announce that I have been re-elected as a committee member of the Kuala Lumpur Bar Committee for the year 2017/2018. 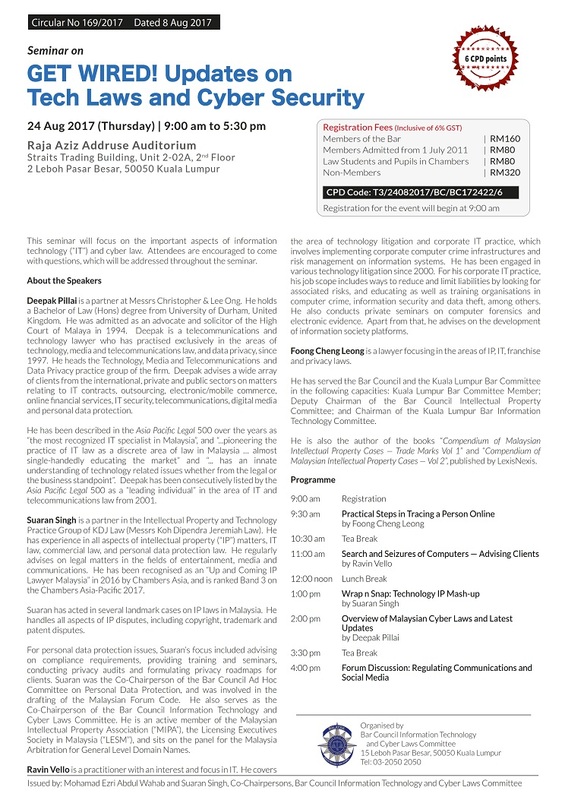 I have also been re-appointed to chair the Kuala Lumpur Information Technology and Publication Committee. This Committee will continue its development of the Kuala Lumpur Bar website, App and membership management system. Last year, I found a box full of cassettes at the Kuala Lumpur Bar Secretariat. They were recordings of various Kuala Lumpur Bar events in the late 1990s and early 2000 where smartphones were not widely available yet (perhaps not even in existence). 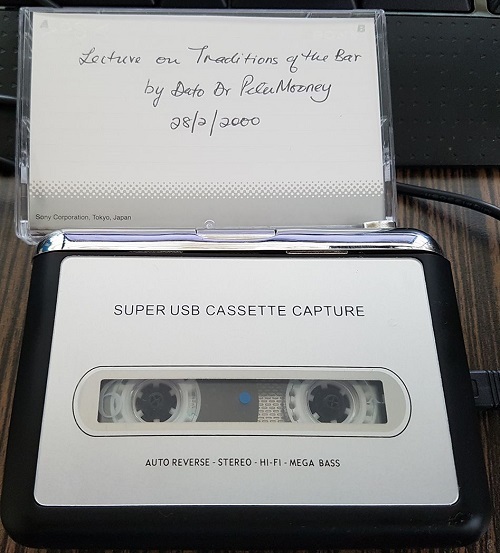 One of the cassettes had the label “Lecture on Traditions of the Bar by Dato Dr. Peter Mooney”. The late Peter Mooney was a very well-known lawyer who, like many early lawyers of Malaya, came from the United Kingdom. Many of his contemporaries had left for home or had passed on. Peter Mooney served as the Attorney General of Sarawak and Vice President of the Bar Council. He was also one of the founding partners of Skrine. He passed on recently at the age of 92. I have converted into a podcast using a device I bought online (above). Some parts of the podcast is a little bit fuzzy due to the age of the cassette (16 years old!). “The independent of the Bar is absolute essential if the system is to work properly and it essential to the liberty of the subject. Justice will be done only if there is a strong bar which is courageous and as well as independent”. I was quoted by The Rakyat Post on laws and regulations relating to social media in Malaysia. The sharing of information taken from another individual, without their awareness or knowledge, containing elements of incitement and slander are offences punishable by law, said legal expert Foong Cheng Leong. He said Malaysia currently had laws on communication offences involving social media, but the government faced difficulties in detecting all the cases that occurred. “The sharing or dissemination of any information that is libelous or slanderous are clear offences under the law. Doing these things intentionally or unintentionally is completely irrelevant in cases that involved social media. “Malaysia has the legislation (needed), but it is difficult for the government to control the activities in social media as there is no party monitoring all the data that goes in and out,” he told The Rakyat Post when contacted recently. He added that all social media users should take their own precautions to avoid becoming victims, apart from depending on the law, because it was impossible for authorities to track every movement in the social media. “Users must be very careful in using these social media platforms as it is becoming more and more difficult for authorities to track down misconduct by offenders. “However, the function of social media cannot be reduced as it should be viewed as a healthy approach. If we withdraw the ‘comment’ box on Facebook, then there will not be any healthy discussion,” he said. Bread & Kaya: Uber and GrabCar services legal in Malaysia? – The apps appear legal under current laws, but are the drivers? ON Aug 7, Malaysia’s Land Public Transport Commission (SPAD) announced on its Facebook page that it had seized 12 cars alleged to have been providing public vehicle services without a licence, under Uber and GrabCar. SPAD said it would bring the matter to court. This is not the first time the Commission has acted. According to a March 3 report in theSun, No escape for operators violating Land Public Transport Act, 39 private vehicles that were used to offer taxi-like services through different mobile applications like Uber, MyTeksi and Blacklane, were seized. App-based transportation network companies such as Uber have been subject to ongoing protest and legal actions around the world. Uber has been banned in numerous countries such as Australia, India and Thailand, as well as certain parts of the United States. GrabCar and Uber are essentially a service which connect users for rides on private cars. For the purpose of this article, I’ll focus on Uber which I am familiar with. I’ve used Uber when I was in the United States and Singapore. If you’re wondering whether Uber and GrabCar services are legal in Malaysia, there is no express prohibition under the law to have software to connect users for rides on private cars. According to a report in automotive portal paultan.org, SPAD chairman Syed Hamid Albar said that existing laws are silent on mobile apps offering public transport services, and this meant that SPAD was finding it difficult to rein in foreign and local mobile apps such as Uber and GrabCar, which it claimed were offering illegal public transport services. However, Uber and GrabCar’s positions are quite clear: They do not provide transportation services but merely connect their users with drivers. Rasier does not provide transportation services, and is not a transportation carrier. In fact, the Company neither owns, leases nor operates any vehicles. The Company’s business is solely limited to providing Transportation Providers with access, through its license with Uber, to the lead generation service provided by the Software, for which the Company charges a fee (“Service”). The Company is a technology company that does not provide transportation services and the Company is not a transportation provider. It is up to the third party transportation providers to offer transportation services to you and it is up to you to accept such transportation services. However, the problem lies with the drivers providing the transportation services. Under Section 16 of the Malaysian Land Public Transport Act 2010 (Act), no person shall operate or provide a public service vehicle service using a class of public service vehicles unless he holds an operator’s licence issued under said Act. (b) he is responsible, under any form of arrangement with the owner or lessor of the said public service vehicle to manage, maintain or operate such public service vehicle. Based on the above definition, Uber and GrabCar do not seem to fall within the scope. Hence, Uber and GrabCar apps are legal in Malaysia. Notwithstanding that Uber and GrabCar apps are legal in Malaysia, are Uber and GrabCar’s drivers legal in Malaysia? Uber and GrabCar drivers can legally provide public transportation service if they are licensed under the Act. From this agreement, it is clear that Uber requires its drivers to have a valid licence to provide “rideshare or P2P transportation services” which are essentially transportation services. Drivers without such a licence are committing an offence under Section 16 of the above Act, or can even be considered as breaching Uber’s own Transportation Provider Service Agreement. The court may also order the vehicle to be forfeited to the Government under Section 80(4) of the Act. In Reza Kianmehr v. PP  7 CLJ 265, Reza Kianmehr was convicted and sentenced to a fine of RM2,000 in default of two months’ imprisonment for the offence of operating a public service vehicle service (in local terms, kereta sapu) without a licence under Section 16 of the Act. His car was also ordered to be forfeited to the Government under the same Act. The reason for regulating public transport service vehicles is simple. We need to make sure public transport is safe to the public. Details of drivers must be recorded and they must meet the minimum qualifications. Those who escape the system are a risk to users and those on the streets. Assuming an accident is caused by an unlicensed public transport vehicle driver where the passenger and person on the streets are injured, would the driver’s insurance cover such injuries, or even death?